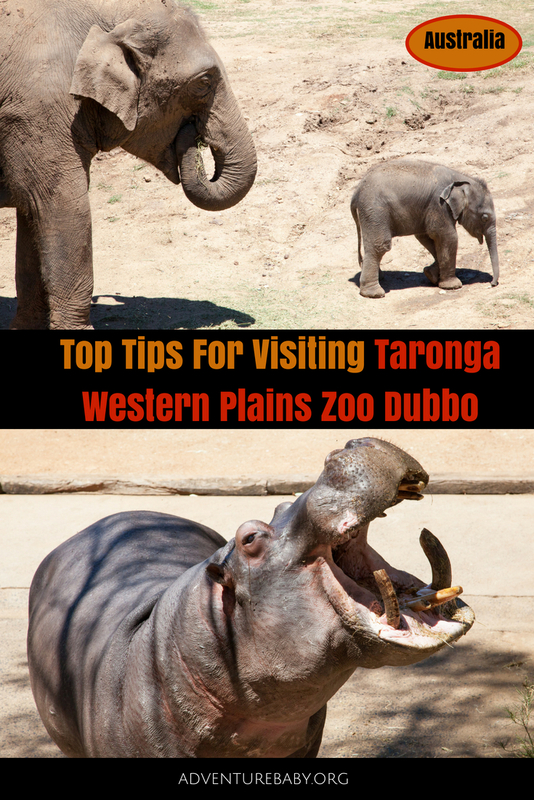 Top Tips For Visiting Taronga Western Plains Zoo Dubbo - Adventure, baby! 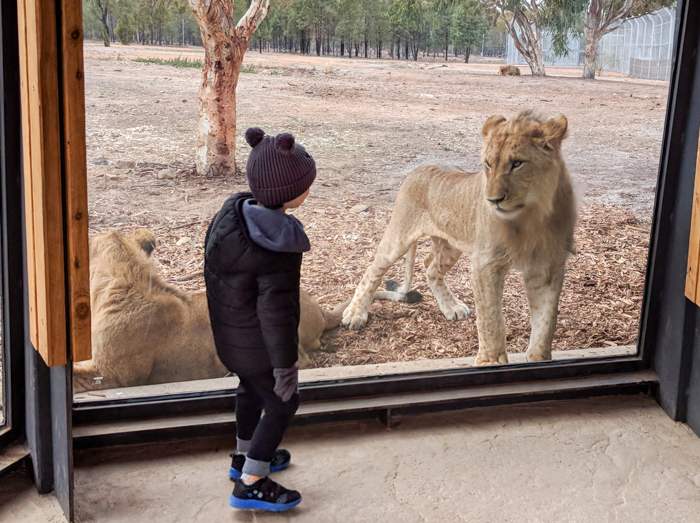 Visiting Taronga Western Plains Zoo in Dubbo is a road trip many Australian families have made over the past 40 years, since the zoo opened in 1977. 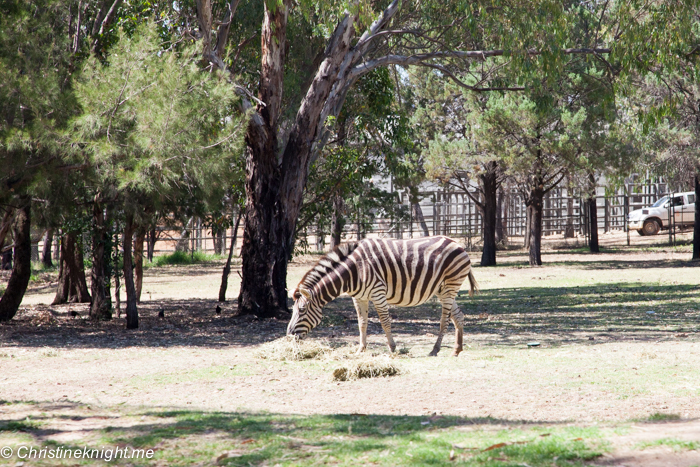 The zoo was opened initially to provide more grazing and breeding space for large animals such as elephants and antelopes, with 35 animals from six countries. 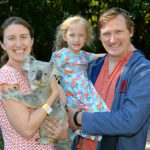 While the design of the zoo has remained the same, with open-range with concealed moats separating the animals from visitors, the zoo expanded significantly after a big financial investment from the government into both Taronga zoos several years back. 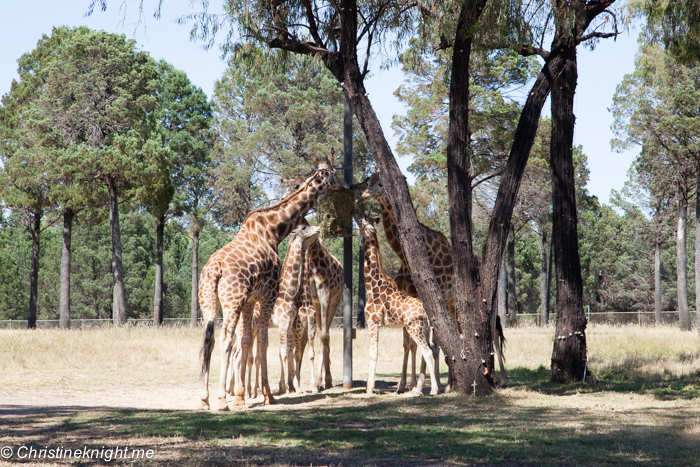 Both Taronga zoos focus on conservation, and at Dubbo you’re able to see their breeding plans in action. 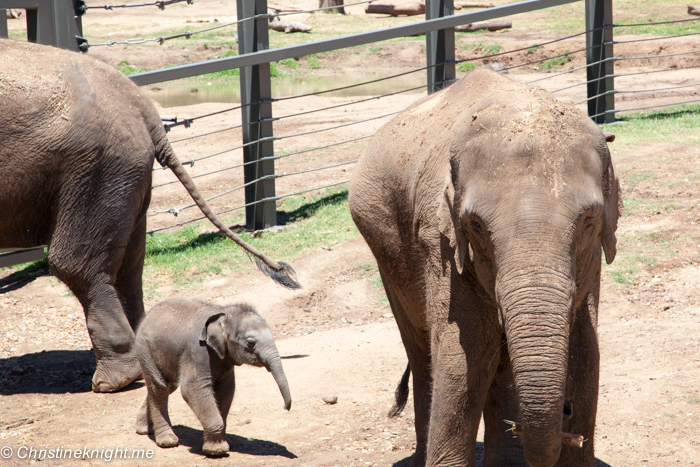 We visited in late spring and were treated with many babies around the zoo, including zebra, 10 wild dog pups, giraffes and Sabai, the three-week-old Asian elephant calf. 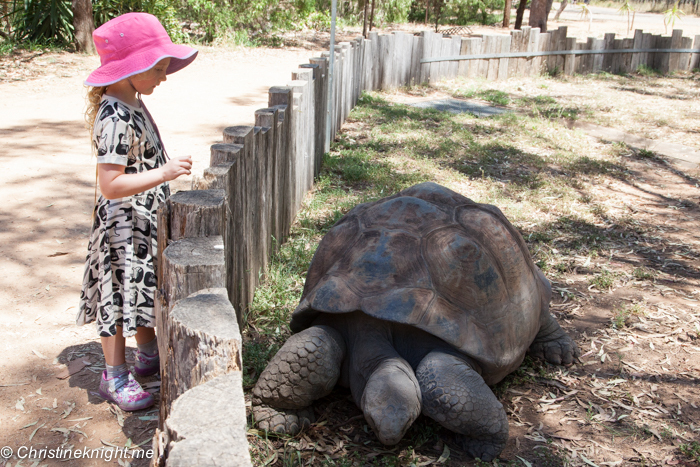 Also on display were the Galapagos tortoises and their babies – the first juveniles I’ve ever seen. 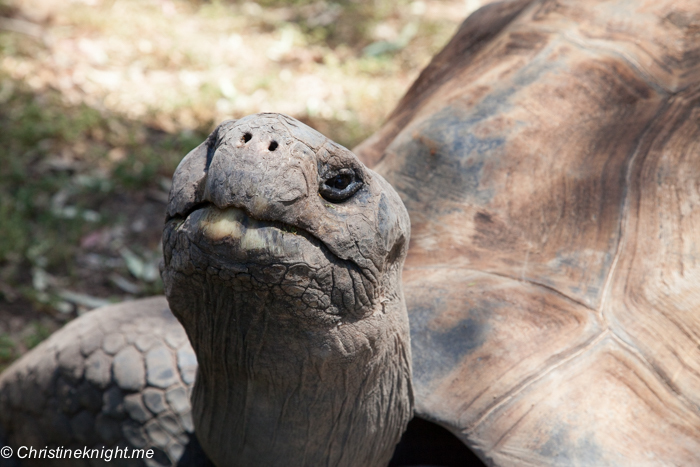 Classified as “vulnerable” due to their decline in numbers, it was remarkable to see the tiny tortoises doing their best to bring their species back from the brink of extinction. 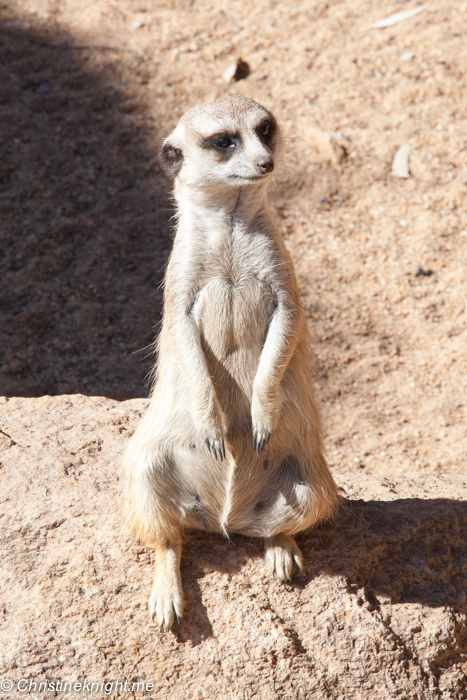 The zoo is home to many endangered animals that can be seen up close around the park. 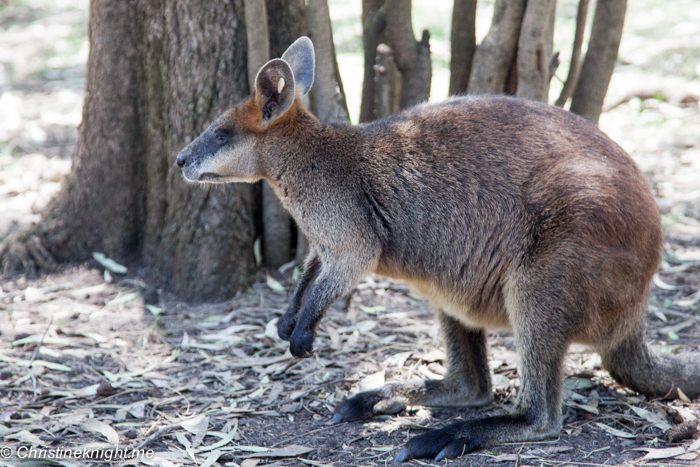 With Taronga’s focus on conservation comes education – the more people who know about the plight of these animals and care enough to make a difference themselves, the better chance we have of saving these species from extinction. 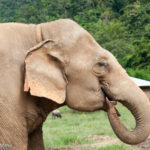 Endangered animals at the park include the Asian elephants, black and white rhinoceros, the bongo, of which there are only 200 left in the wild, and the Sumatran tiger. All of the money you pay at the zoo for everything from admission to souvenirs, goes back into the upkeep of the animals and their conservation programs. 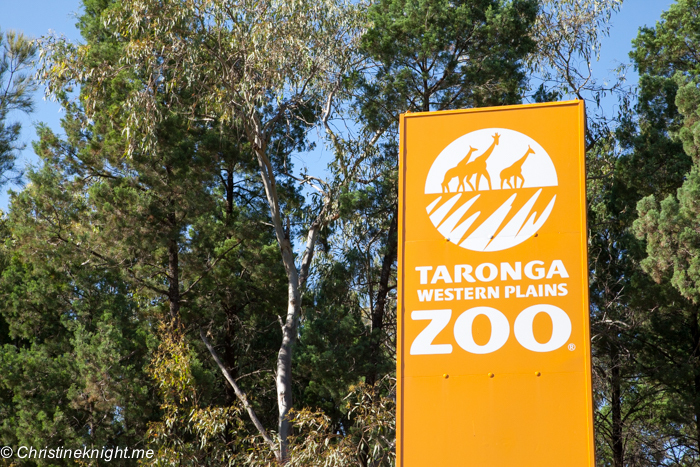 I always think it’s best to know before you go, so if you’re heading out to Taronga Western Plains Zoo soon, these tips might help you out. 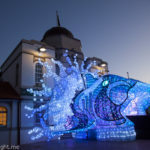 One day is pretty rushed and there is a lot to see and do, including free talks by keepers as well as upgraded activities that cost a bit extra. Admission for two days is included in a one-day entry, so it also makes your money go further. 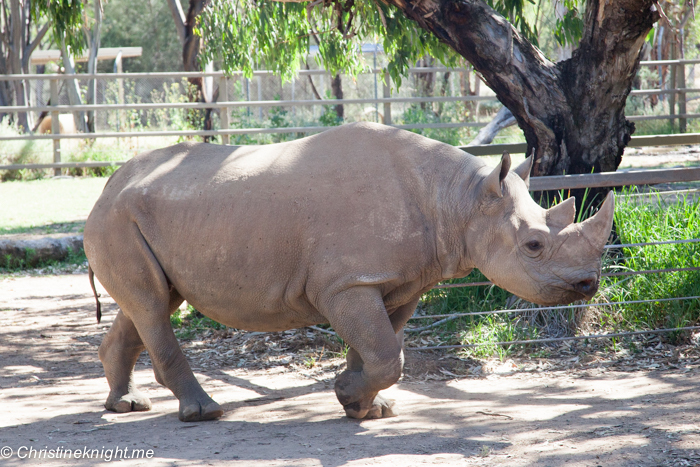 You can get around the zoo with your own car, but what’s the fun in that? 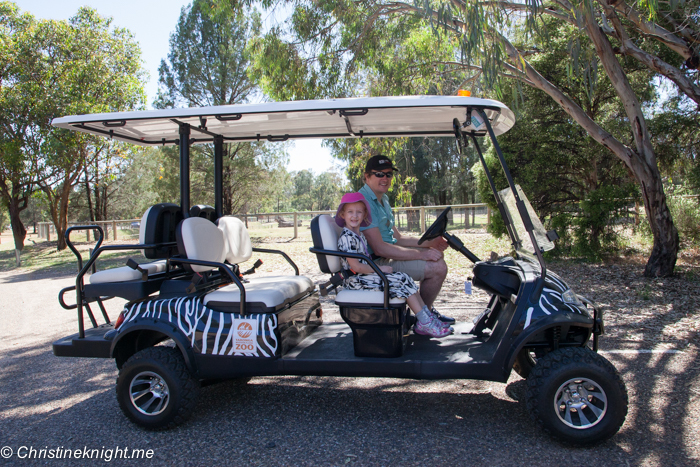 The most popular mode of transport is an electronic buggy ($69 for 3 hours). To secure one, arrive at least 10 minutes before opening time as they book out fast. 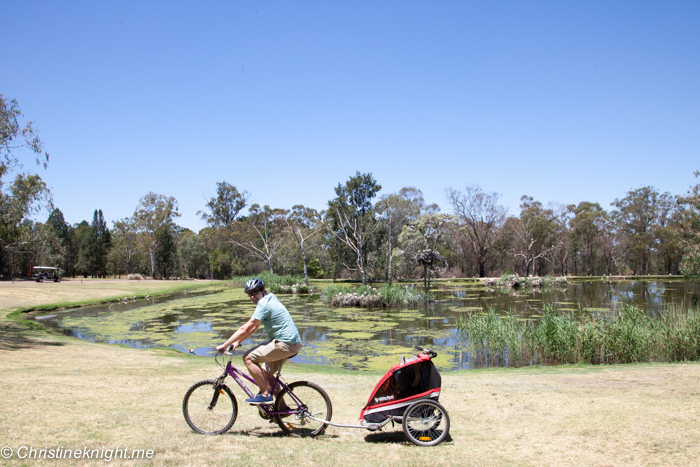 Our favourite way to see the zoo was by bike, as it allows you get off the main road and ride through the bush trails as well as getting some exercise. You can bring your own bikes or hire them ($15 for a bike, $25 for a bike with kid seat, $29 for a bike with caboose for the entire day). The animals are most active in the early morning. On a hot day, by midday the animals are all snoozing in the shade, so it’s worth your while to be early. 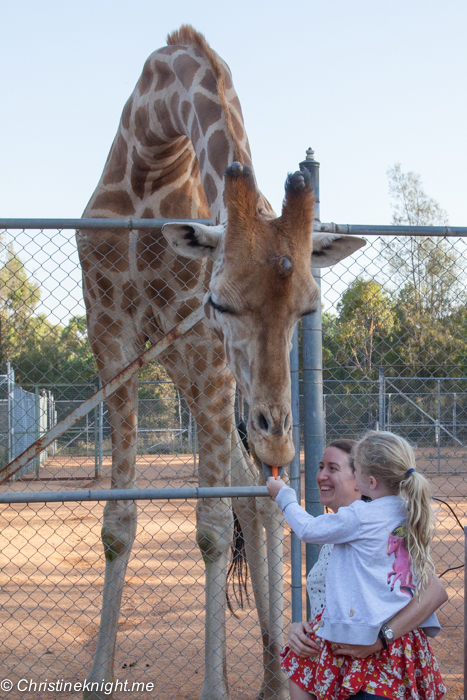 The cheapest and most fun is the giraffe feeding for $7 per person. Who doesn’t want the chance to feed one of these majestic creatures? More info on animal encounters here. 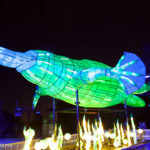 The scheduled talks start early in the morning when the zoo opens and continue around the zoo path, so you can easily just go from one to the next. The main benefit in this is the keepers usually feed the animals at the same time as their talk so you can see them close up and active. 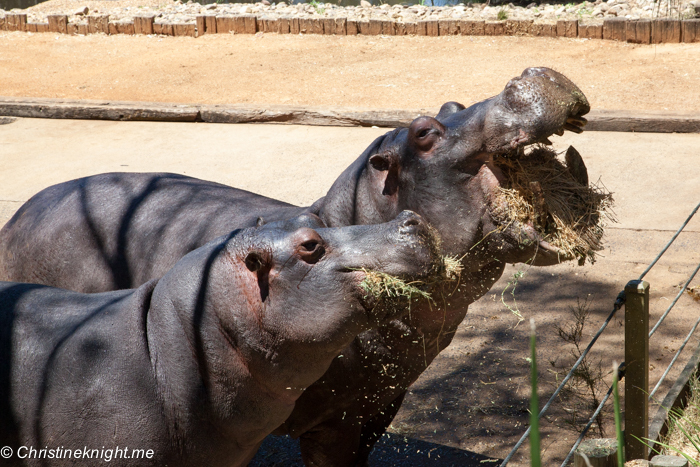 We visited the hippos, for example, before the talk and couldn’t even see them in their large enclosure. When we returned for the talk, the keeper had them right up near the visitors’ platform showing off their massive teeth. 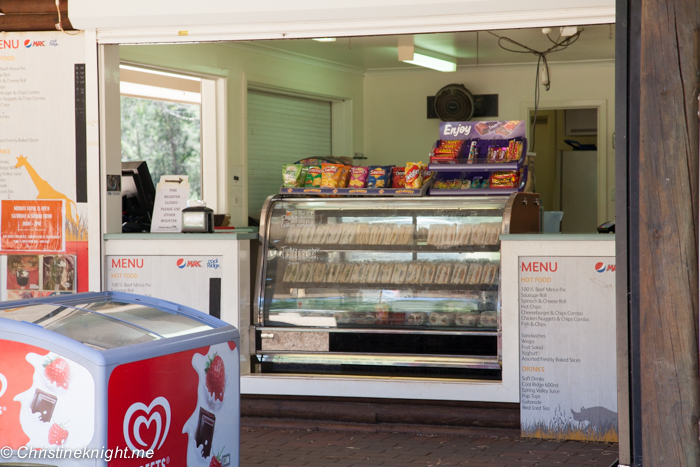 While there is a cafe at the entrance and a kiosk halfway around the 6km circuit, the food at the zoo is basic and expensive. There are plenty of picnic spots around the zoo in the shade so if you can bring your own food I would highly recommend it. 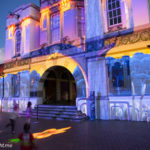 If you book your tickets online, you get 20% off entry fees. You can also book animal encounters online – and I highly advise you do so well in advance of your trip, as the popular ones book up very quickly. Book your tickets here. We drove up from Sydney the day before and stayed the night in the excellent Best Western Bluegum Motor Inn. For $175 a night we were given an upgrade to a gorgeous newly renovated family room with air conditioning, one queen and two single beds, a fridge with no mini bar (hooray! ), free internet, complimentary water, milk and apples. 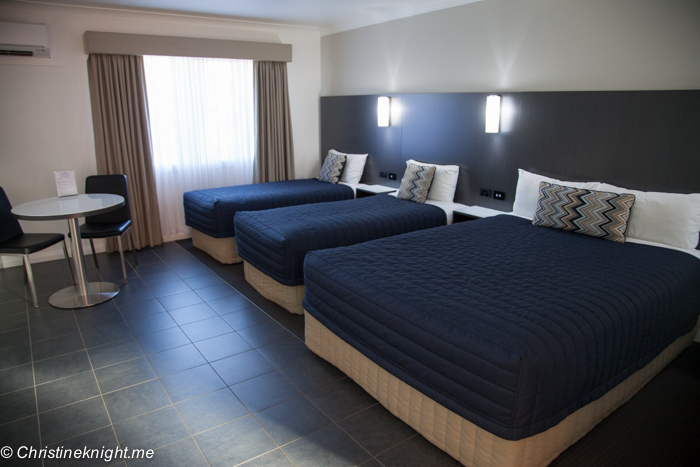 The motor inn is right in the centre of Dubbo, only a few minutes drive from several restaurants and a large Coles, plus there is a park with a playground across the road. 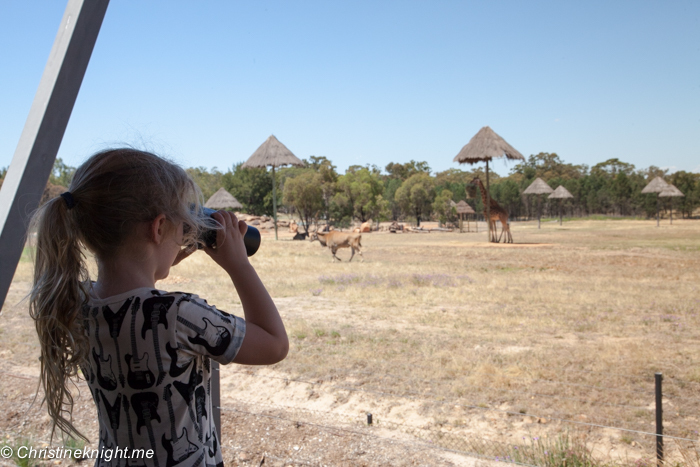 It’s an 8 minute drive from the Best Western to Dubbo zoo. This was hands down one of the most incredible accomodation experiences we’ve had. 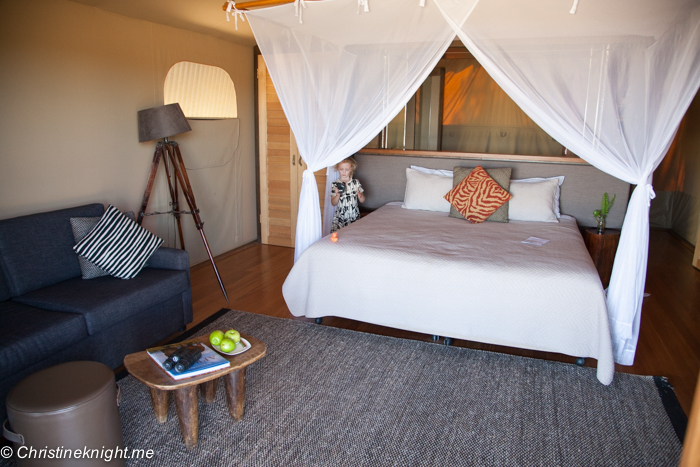 We stayed overnight in a Zoofari Lodge within the zoo – a luxe cabin situated right on the edge of an African savannah where giraffe, zebra and eland roam freely. A roaringly good time awaits at the incredible Lion Pride Lands exhibit. 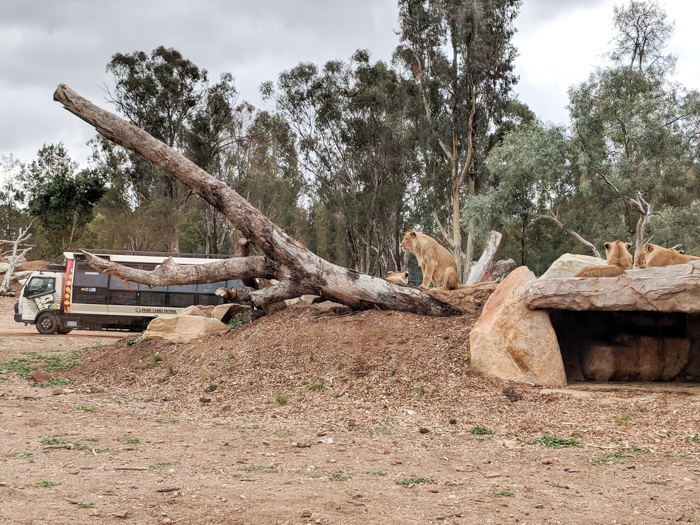 8 lions and lionesses, including a large male named “Lazarus” live in a sprawling 3.5 hectare enclosure with plenty of vantage points. The best viewing is from inside the cottage with glass walls. 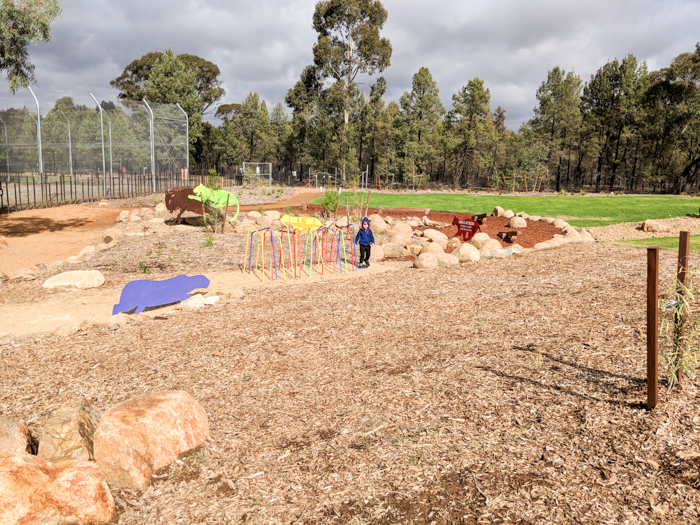 A playground keeps the kids happy, and encourages them to pretend to be lions themselves with a tunnel to crawl through, beams to balance on and rocks to climb. 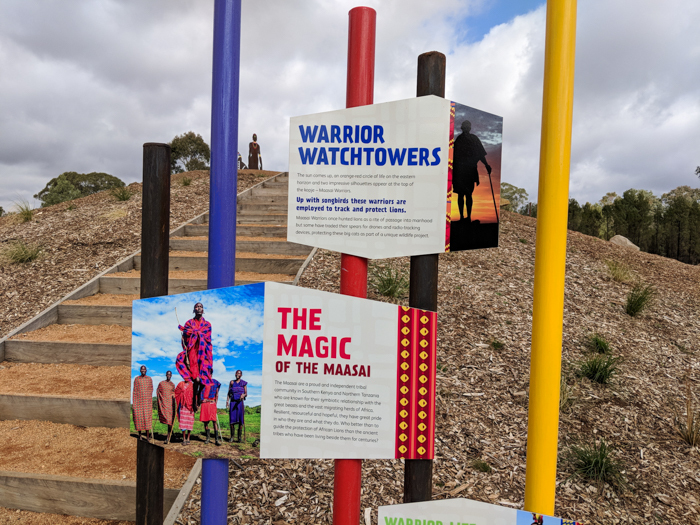 Next to the playground is the replica African Maasai village including a hill that you can climb up to survey the land, the Masai watch tower. 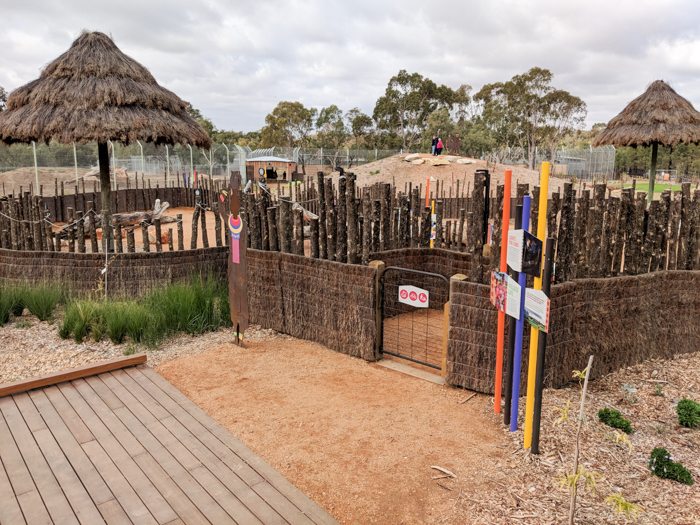 Learn about how African people live beside lions and pat the goats that live in the replica village. For an additional fee visitors can take a ride on a safari truck inside the lion enclosure. 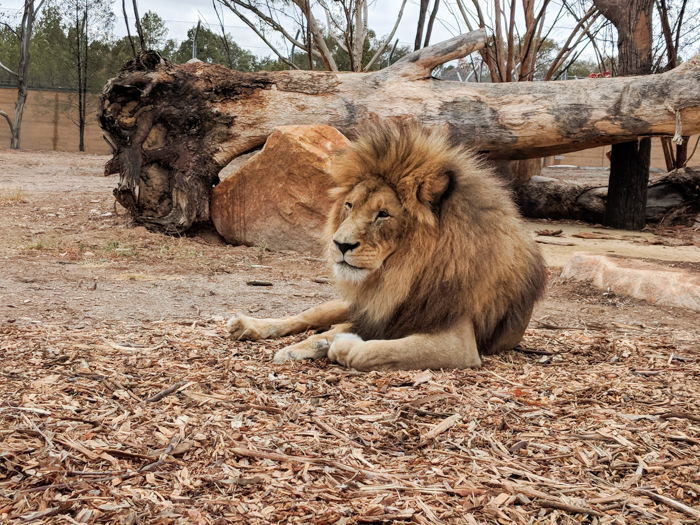 If you are in the first safari of the day (at 9.30am) you get to see them letting the lions out of their night time enclosure and being given their breakfast. 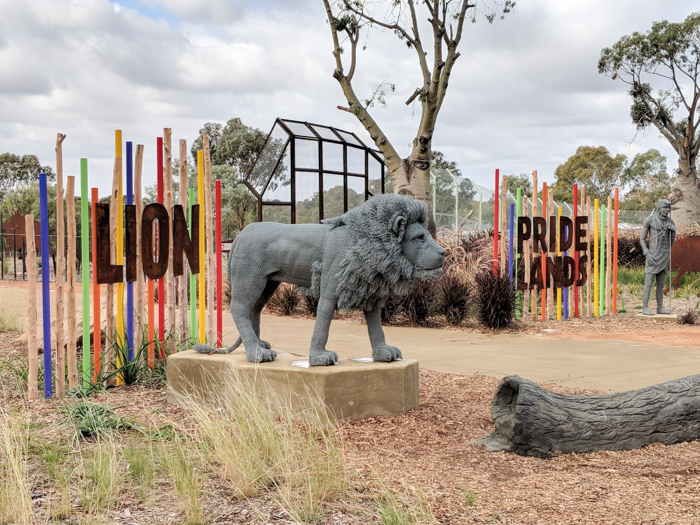 The Lion Pride Lands exhibit is located at the very end of the Dubbo Zoo loop. Catch the daily keeper talk at 10am to have the lions all to yourself! 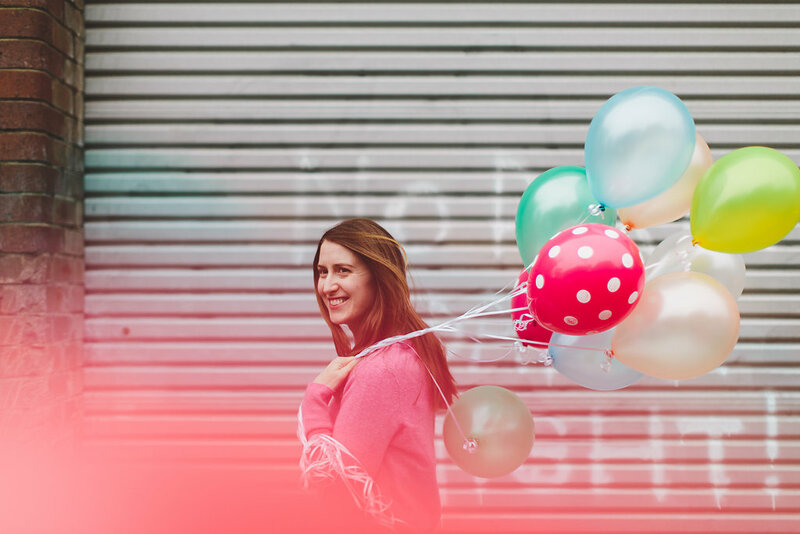 Thank you to Lisa from 2TinyTravellers for this update! 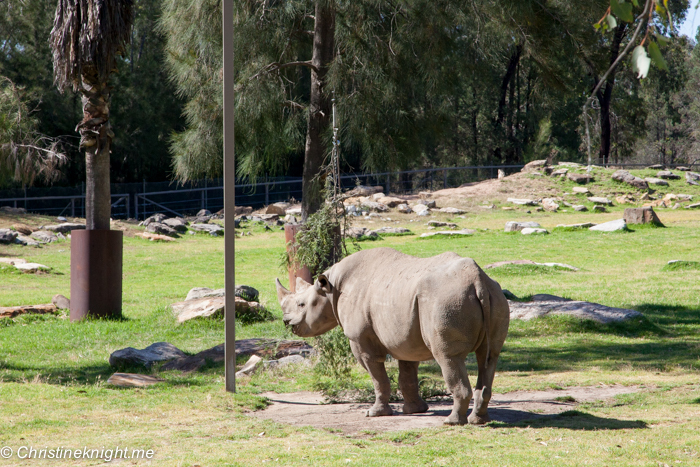 We received entry as guests of Taronga’s Zoofari Lodges. 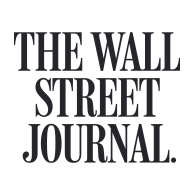 All opinions and tips are 100% our own.